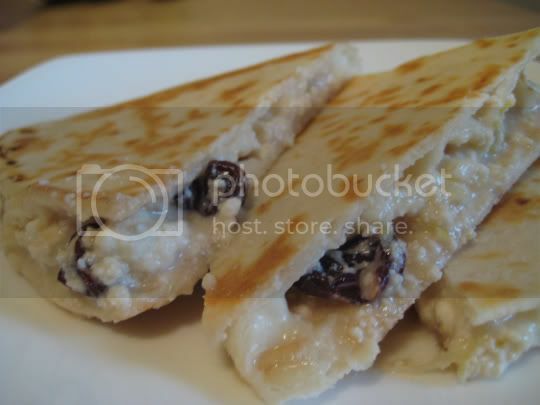 Interesting twist on a quesadilla, but great nonetheless. I used some dried cherries that I already had, instead of the dried blueberries called for in the recipe(which were $6 per 8-oz. bag at my local Trader Joe's...ha!). The mozzarella added just enough savory flavor to keep this dish from being too much of a dessert. Warning: these things will get messy when you eat them! Make again? Definitely, and serve with something savory on the side (veggie sausage, mmmm). Wow these are really good pictures. I don't even like blueberries--or cherries-- but you made this look very yummy.